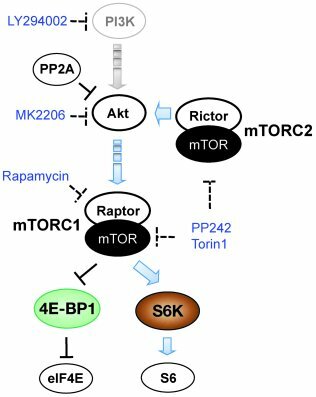 Activities of Akt, mTORC1 (Raptor complex), mTORC2 (Rictor complex), and S6K kinases are shown. mTORC1 phosphorylates and inhibits 4E-BP1, which prevents 4E-BP1 from sequestering the eIF4E cap-dependent translation factor. Kinase inhibitors used in this study are shown in blue, and the respective targets are designated by dotted lines.